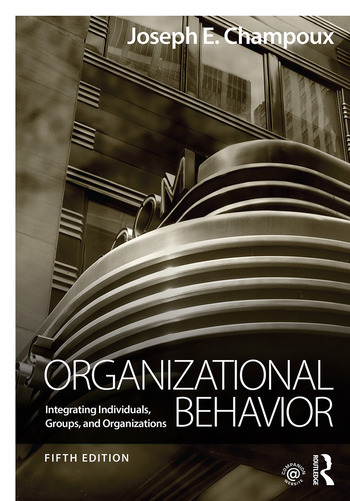 Organizational Behavior concisely covers the essential theories and concepts students need to understand about behavior in organizational settings in the twenty-first century. Readers interested in management will find insight into into their own behavior and the behavior of others to help them perform effectively in organizations. Champoux has carefully selected the topics and built them into frameworks useful for explaining, analyzing, and diagnosing organizational processes. Covering both micro and macro perspectives on organizational behavior, the book includes new topics on leadership styles, generational differences, and technology in the workplace as well as plenty of examples to help students understand the application of various concepts and theories. Upper-level students of organizational behavior will find the book a useful explanation of managerial and organizational situations. A companion website, featuring instructor manual, test bank, and PowerPoint slides, provides additional support for students and instructors. Joseph E. Champoux is a Regents’ Professor of Management Emeritus at the University of New Mexico, USA. He has published extensively, in such journals as the Academy of Management Journal, Journal of Management Education, Personnel Psychology, and the Journal of Organizational Behavior.